Making Baby Food: You Would Think This Would Be Easy - Dads Change Diapers, Too! Making baby food. You would think this would be easy, right? As you’ve no doubt read in previous DCDT posts, I’m a big fan of gadgets. If there’s a problem that can be tackled with some piece of technology, chances are real good that I’m going to try and convince MOMPC that we should probably buy it. It’s funny, then, that this time around MOMPC was the one applying the full court press. She had tried her hand at mushing food up. Bananas and avocados squish pretty nicely, but after NPP ejected those meals from the depths of his gut for the tenth time, we realized we needed to get it smoother. He loved the organic jar food that we gave him, but wanted nothing to do with the chunkier foods we were making. MOMPC had been doing some research, and found the Baby Brezza Elite was on sale at Babies R Us (Amazon is currently the cheaper price). It was perfect. We wouldn’t have to have pots and pans to clean, and our blender could stay relegated to making smoothies and mixed drinks. I picked one up, and brought it home. 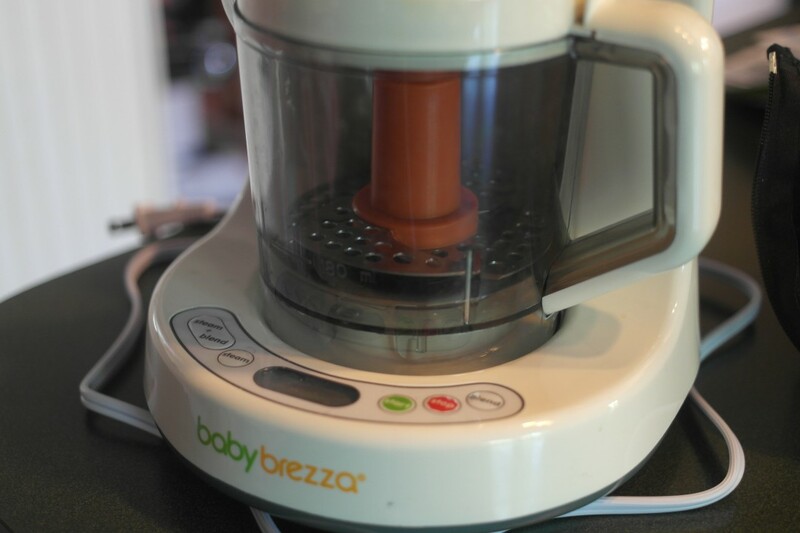 The short review of the Brezza Elite is that it’s great for steaming the foods, but if your kid has any aversion to textures, you’re going to run into trouble. It doesn’t puree, it just blends, and that’s a big problem for NPP. Thankfully, we had a Magic Bullet Blender sitting around, and that really did the job. We were hardly using it anyways, so now it would serve a purpose. This is where the economics of making baby food take on a “marathon” approach, rather than a sprint. The “hidden costs” of making baby food aren’t what you’d expect, but the good news is that most of them will be repurposed once we’ve switch off of purees. For example, the Whirlpool Freezer that we bought to store milk and food will eventually be the home to half of a cow and popsicles. Other things, however, aren’t really going to serve a future purpose, and I guess that’s okay. There’s the baby food storage trays we use to freeze the food. I guess maybe we could use those for Jello shots one day? There’s the aforementioned Brezza Elite. Not much we can do with that one. So if you take out the price of the freezer, it probably all comes out in the wash as to whether or not we’re saving money. That being said, what we’re not saving in the wallet, we’re saving ten-fold knowing what foods NPP is eating. The only other real cost is the time it costs to make the food. Most fruits and veggies require some sort of cleaning and/or peeling. That takes a few minutes. Most fruits and veggies require a minimum of 15 minutes to steam, with some taking as long as 25 minutes. Fortunately, the Brezza is a one-button set-it-and-forget-it system. Once it’s been peeled and steamed, it needs blended. That’s a few more minutes; no big deal. Once we’ve blended it, it goes into the baby food storage trays and makes its way down to the freezer. After 24 hours, it goes into storage bags, and awaits its delivery into NPP’s mouth. Truth be told, it’s definitely easier to just go to the store and buy the jars, but that really adds up. I think the worst thing about this whole process, though, is that it’s only for a few months. All this work until NPP starts eating people food. Then we just stuff him full of hot dogs and mac n cheese. Questions about this process? Want to know more about the Brezza Elite? Leave a comment below and I’ll do my best to answer it! Buying Our Child’s Safety. Or….Not. Next story Buying Our Child’s Safety. Or….Not. Previous story To Make Food, Or Buy It?